Sports injury & pain management clinic Pain Physicians NY in Brooklyn & NYC leading by the best rated pain management doctor Leon Reyfman provides a full range of advanced pain management treatments including massage therapy, stretching exercises, electrical nerve stimulation, IFC (Interferential current stimulation) to treat Piriformis Syndrome. We also offer latest cutting edge procedures: Stem Cell Therapy, Body Composition Analysis, High Tech Shockwave Therapy, groundbreaking Interstitial Laser Therapy. Piriformis syndrome is a medical condition in which the piriformis muscle spasms and causes pain in the buttock (buttocks are the place where the piriformis muscle is located). The piriformis muscle can also irritate the sciatic nerve, which is nearby and cause also pain, numbness or tingling along to the back of the leg and into the foot. The piriformis muscle is localized deep in the buttock, starting at the lower spine and connects the upper surface of each thighbone. The piriformis muscle assists in the process of rotation of the hip and turning the leg and foot outward. Muscle spasm in the piriformis muscle, either of the irritation of the muscle itself, or from the irritation of the nearby structures like for example the hip or sacroiliac joint. Piriformis syndrome usually starts with pain, numbness and tingling in the buttocks. The pain depends from one person to another. It can vary from mild, moderate to severe and it is localized in the buttocks, but also extends down the leg to the toes. The pain caused by the piriformis syndrome can sometimes be triggered from climbing the stairs, sitting for a long period of time, compressing directly over the piriformis muscle, etc. 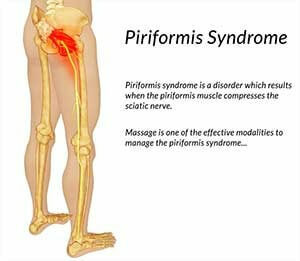 There is no single examination or diagnostic tests that will help your doctor diagnose the Piriformis syndrome. Piriformis syndrome is diagnosed basically due to the patient’s symptoms, but also by excluding other possible causes for the signs and symptoms of the patient. Treatment of the Piriformis syndrome depends on the cause and the severity of the pain and other symptoms. Ice packs and ice massage on the painful area are very helpful. However, for some patients it is also very helpful to alternate the cold with heat. NSAIDs also help decrease the inflammation in the affected area. Local anesthetics, corticosteroid injections or pain relief injections can be applied directly into the piriformis muscle in order to help decrease the muscle spasm and the pain that is caused due to this muscle spasm. Botox injections are also a treatment option in cases when anesthetic or corticosteroid local injections are not successful in controlling the pain. Botox injections will help reduce the muscle spasm and the pressure from this muscle spasm on the sciatic nerve. TENS (Transcutaneous electrical nerve stimulation) or IFC (Interferential current stimulator) are another treatment option for the Piriformis syndrome in order to reduce the muscle spasm and relieve the pain. This procedure is performed by our Brooklyn chiropractor and leading physical therapy specialist Dr. Lipnitsky.